Welcome aboard! Charter this stylish French 46′ Fountaine Pajot Bahia 46 and sail out on tropical water, a romantic journey is right ahead. 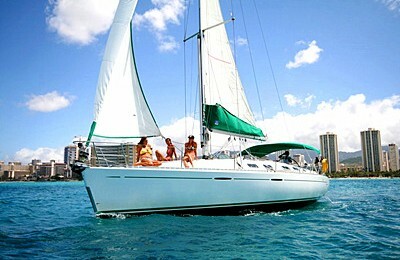 This 46’luxury private catamaran sailing yacht is spacious and comfortable. You will find designer’s touch throughout this yacht which has been ranked top catamaran in her class by sailing magazine. The partially covered cockpit salon offers a welcoming lounge area, spacious for up to 12 adults to have a party over the water. A lovely kitchen is right in the middle of the cockpit and main saloon area, great for entertaining. Walk to the front deck, you will find a huge trampoline in the front, perfect spot for sunbathing or just hanging around to enjoy the sea breeze. Inside the salon, you will be amazed by the 360 degree panoramic view from her large windows.She is pretty steady while sailing over the ocean, thanks to the twin hulls and wide beam size, great for people who tend to get sea sickness. Sail out from Waikiki harbor,enjoy amazing view from diamond head to pearl harbor, sail to the tropical blue ocean on a sunny afternoon, lay back and relax. Come back with a stunning sunset, to make your journey unforgettable. 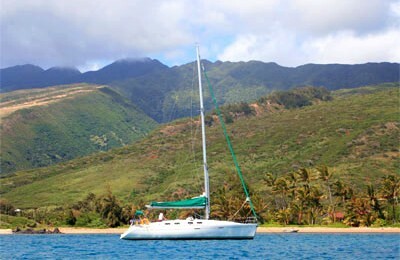 Base price includes 3 hours private yacht charter for up to 6 guests, you are able to book extra hours while check out. 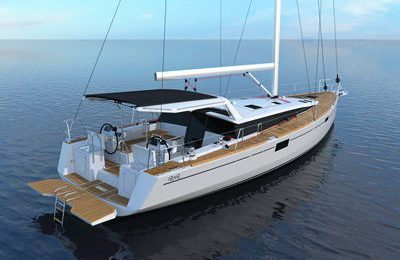 A 39′ (12 meters) Fontaine Pajot catamaran sailing yacht. 3 sleeping cabins,2 heads(restrooms),propane cook top and oven,microwave oven,air conditioned saloon area. Amenities : kayak,snorkel gears,paddle board,towels are included in the price.